COURTESY PHOTO The NYSSMA All State Mixed Chorus performing in Rochester on December 3. 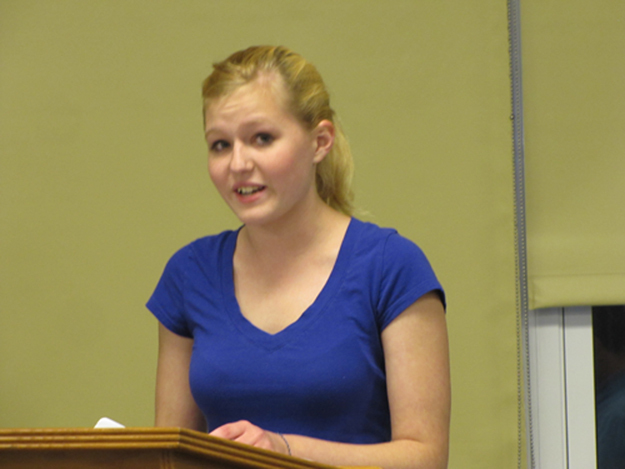 JULIE LANE PHOTO | Student Libby Liszanckie will travel to Rochester with the All-State Mixed Chorus in December. At Monday’s Board of Education meeting, members assured former Board President Rebecca Mundy that the newly formed booster club would be raising money to help support various school activities, but is not intended to replace programs the district would traditionally fund. Ms. Mundy is on the committee organizing the booster club. Ms. Munday said there had been rumors in the community that money raised would be used to pay for existing programs to unburden district taxpayers. “I just want to make sure we’re not leading down that path,” she said. Activities the booster club could fund won’t be limited to sports, but could also include other activities such as a trip for Libby Liszanckie to travel to Rochester with the All-State Mixed Chorus in December. She was selected to join the chorus as a result of her performance at the New York State School Music Association earlier this year. What the district is responsible for will remain the same, board member Linda Eklund said. Member Thomas Graffagnino stressed the importance of clarifying that issue so boards in the future understand the purpose of a booster club is to enhance activities, not pick up the tab for programs the district provides. As soon as the framework for the booster club is established, the public will be told about the goals and included in the planning, Ms. Eklund said.